Bourguignon beef and pasta, freeze dried meal. Bourguignon beef and pasta MX3 is a beef, pasta, carrots, mushrooms and a creamy sauce. 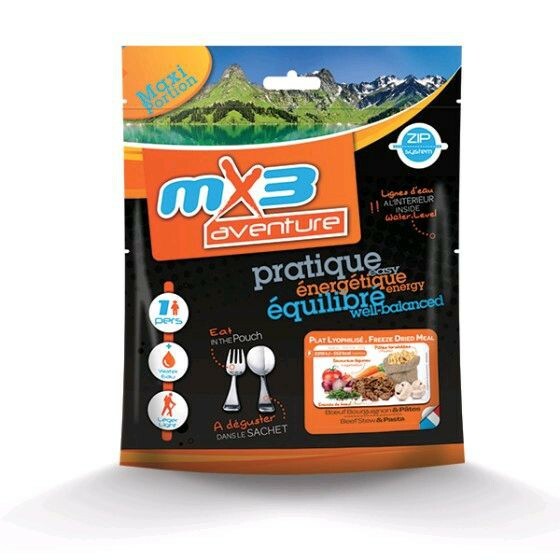 Pre-cooked pasta (WHEAT), beef 15.7%, vegetables 13.5% (carrot, mushroom, tomato, onion), vegetable fat, sunflower oil, MILK protein, maltodextrin, natural red wine extract (not maltodextrin (SULPHITES), modified potato starch, natural, fat of beef, caramel (glucose syrup, sugar, maltodextrin), salt, pepper, thyme.